and to the north a succession of high mountain peaks (all over 1000m), which are often separated by deep gorges. Three of those gorges are very good for walking. If the length of the Samaria gorge or the crowds visiting it have discouraged you from walking through a gorge, this is your chance to change your mind. All three gorges are quite as beautiful, and yet much smaller, quieter, and easier to cross. 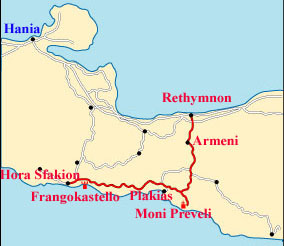 The first, the Imbriotiko gorge, is 3 km long, and the path for climbing it starts from Komitades and ends in Imbros (total route length: 4 km). The second, the Agios Nektarios gorge, is 2 km long, and the path for climbing it starts from Agios Nektarios and ends in Asfendou (total route length: 3.5 km). The third, the Kallikratiano gorge, is 1 km long, and the path for climbing it starts from Patsianos and ends in Kallikratis (total route length: 4 km). As mentioned, all three gorges are quite small, so you can start early in the morning and walk through them without great effort. In the process you will also enjoy the gradual change of scenery as you move from the sea to the desolate Sfakia countryside with its typically poor villages. No matter how slow your pace, you will certainly have enough time to rest, to walk leisurely back - you should be at your base no later than early afternoon - and to cool off with a good swim. Certainly, you can lock up your bike at the village from where your hike begins and go as far as your strength and desire takes you. But if you can do it, we think it is worth walking to the village at the other end of the gorge. Imbros, Asfendou and Kallikratis are all very picturesque with their traditional stone-built houses, and if you do not visit them by following Route 11 you ought at least to hike there on a break from Route 12. As you drive on the main coastal road, you will see many dirtroads - or even asphalt ones - branching off toward the sandy beaches to your right. The first one on your way is the large sandy beach in front of the famous Frangokastelo. 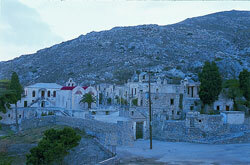 Next to Frangokastelo one can see the abandoned monastery of Agios Haralambos. Unfortunately, only its church has survived, while all the other buildings have fallen apart. Just east of the monastery lies a beautiful beach with big sandhills. Frangokastelo is just one more fort that testifies to the Venetians’ vain desire to impose their rule even in those parts of the island where they had nothing to gain. It was built in 1370, thanks to the insistence of the feudal lords of Rethimno, but it was never used, at least not by the Venetians! The locals paid no attention to this isolated and harmless fort, and they kept on living unsubdued... taking their rebellions just a little bit further. The decline of its glory started from its very first day. The Venetians grew tired of sitting around in a remote fort doing nothing, the garrison was reduced to very few men, and the guards napped on their posts, lulled to sleep by the waves and by the sound of the bells of the local shepherds’ goats. How can you play the part of the defender of a place if no one is willing to attack you? The cannons soon grew rusty from disuse, and the fort, gradually abandoned, started falling apart. It took another 450 years before there was some action to justify the fort’s existence. We are speaking of the amazing Frangokastelo battle (1828), which took place between the Turkish army, led by Moustafa Pasha, and a Greek army force from Ipiros, led by Hatzimichalis Dalianis. Now, what business did an army force from Ipiros have on the island of Crete is quite a long story. The Cretans advised Dalianis to follow their own tactics, but he did not listen to them. He called them “cowards” and proceeded to do things his own way. Ignoring the insult, the Cretans wished the brave Ipirian leader “good luck” and retreated to their mountains. Dalianis, on the other hand, ranged his men in the valley in front of Frangokastelo and waited for the Turks to show up. When they did, a fierce battle started, which resulted in twice as many deaths on the part of the Turks. After an hour or so, 200 Greeks had been killed -their leader included - compared to 400 Turks. If things went on like that, the remaining 400 Greeks did not have much future in the fight against the 8000 Turks opposite them. They wised up at the last moment, saw an empty fort behind them, and quickly barricaded themselves in it. And so it happened that for the first time in 450 years the fort fulfilled its purpose! And in spite of being abandoned it did its job very well! The besieged managed to keep the Turks away for seven days. By that time, Moustafa Pasha had begun to feel threatened by the quiet reinforcements he saw gathering up around him, and he chose to withdraw his men discreetly. As a gesture of good will, he allowed the exhausted warriors to leave the fort, promising he would not harm them. Then he tore down a big part of it and started retreating toward the northeast. But the Sphakians who had come to the aid of Dalianis waited for him at the gorges. They were not used to gestures of good will (and why should they be?) so they viciously attacked him and destroyed his army. If you want to get an idea of the terrible condition in which the besieged soldiers were when they left the fort, come here on June 4, 5, or 6 at the crack of dawn. You will see the Drossoulites, the sad ghosts that each year appear before the walls, floating about gloomily. This vision or mirage has not yet been explained, and it is certainly very interesting. Frangokastelo survives in very good condition, thanks to the last repairs made by the Turks in 1866. Above the gate one can will see a somewhat worn stone, on which are carned the Lion of St. Marcus and tow coats of arms belonging to Venetian feudal lords. Although the area around Frangokastelo has just begun to be developed, most hotels and Rooms to Let are ugly, because they were designed and built quickly and without any aesthetic concerns. The only exception is the guest house at Patsianos, which was built very recently and doesn’t have a phone yet. If you’d like to camp, the beach of Frangokastelo is all yours, and the taverns all around will help to cover your needs. 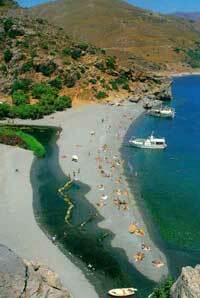 The next attractive beach as you go east is the sandy Korakas Beach. This can be reached by the dirtroad (D3) that you will see a few kilometres after Frangokastelo or by an asphalt road (A3) that passes through Rodakino. Needless to say, it, too, is surrounded by several small hotels, Rooms To Let, taverns and restaurants. When you reach Selia you will see a dirtroad (D2) that goes south. A little before it reaches the shore another road branches off to the west and takes you to Souda, a wide beach with palm trees. by a few fishermen from the nearby Sellia. Until 1970 it had no more than ten permanent residents, but today it has about twenty hotels, five hundred rooms that are rented out to tourists, and many restaurants, bars and discos that serve the needs of the huge crowds that arrive here every year (and we are talking about five-digit numbers). The main attraction is the large sandy beach of the village, but unfortunately this is usually covered with rented umbrellas and deck chairs. (However, you will find a few quiet and clean corners at the west and east end of it). If you absolutely must stay here, your best choice is the Plakias Bay Bungalows, a well looked after complex at the east end of the beach, away from the noise of this cosmopolitan resort. (If you are hungry, by the way, there are plenty of taverns on the main road of the village, but we recommend Sunset, the fish-tavern at the west end. Despite its banal name, it serves fresh fish that are very well done as well as many other tasty dishes). An alternative to the bungalows type of accommodation is the Plakias camping. It is a big site at the village entrance that should give you plenty of space, but the truth is you must look hard for a quiet spot to settle. 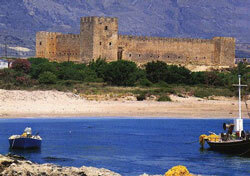 For true camping, away from the tourist crowds, head east of the village, in the direction of Lefkogia. The road (A3) is intersected by a second road that leads to the Damnoni beach (which was very beautiful once but has now been spoilt by the sight of a huge, rich-people’s bungalows complex that was built here by a Swiss company). Pass the intersection, and a little before Lefkogia turn right on the road (A3) where you will see a sign that says “HOTEL RESTAURANT AMMOUDI.” This road ends at a wonderful sandy beach, full of shade-giving trees, a secluded place that is ideal for camping. About two hundred metres to the back is the very good “Ammoudi Hotel & Restaurant”, a small and elegant building that belongs to the Daskalakis family. Other than that, the beach is empty of buildings, and it still has great natural beauty (but for how long?) It is ideal for relaxing - though you can always visit Plakias when you want to see some action - and it is also a great base for small trips in the area. The Amari valley in the east and the Sphakia region in the west are among the places to visit. After Lefkogia you will see a road (A3) to your right, which goes to a hamlet called Gianniou. Turn on this road and follow it to the village. From here on you continue on a dirtroad (D3), which takes you to a pass between two hills. Right after the pass you get a view of the Libyan sea and soon afterwards the Preveli monastery (Moni Preveli) appears before your eyes. To be precise, this is the Pisso Moni Preveli, to be distinguished from the Kato Moni Preveli that is close by. mostly - turbulent history. Like most monasteries in Crete (or Greece, for that matter), it frequently served as a refuge for rebels or even as their base of operations. During the second world war it offered protection to the allies; it was here that they found refuge, and it was from here that their departure from the island was organised. Today, the monastery’s small but well organised museum contains many interesting exhibits, precious relics that the monks were able to save from destruction. Among them is a silver-plated cross, which, as the story has it, is made of wood from the Holy Cross and has the power to work miracles. The buildings you see at the monastery are not the original ones. Those were destroyed, rebuilt or modified so many times that nothing is left from them. The church was built in 1835. It has a beautifully carved wooden icon screen with wonderful icons, some of which come from the church before it. Especially noteworthy are the icons of Christ the High Priest and of Adam and Eve in Paradise, at the left door-leaf and the lower right corner of the icon screen respectively. The latter catches the eye with its great variety of birds, fish and animals painted in bright colours, and both are works of Michail Prevelis and date from 1750. The works of this monk as well as the other treasures of the monastery and its exciting history are a good reason for visiting the place. And if you go in early spring or late fall, when there are not so many visitors around, Father Kallinikos and Father Chryssanthos, the two monks that live there, will be glad to show you around. Incidentally, Father Chryssanthos speaks very good English. This monastery is in a terrible condition, and little by little it falls apart. The cells still have walls, but they have no roofs. The church, which is dedicated to Jonh the Baptist, has a roof, but it has suffered great damages and it was both abandoned and vandalised. Yet the fountain at the entrance can still quench your thirst. About 500 metres north of the abandoned Kato Moni Preveli is a road (D3) that goes east. At the intersection you will see a misleading E sign that says “Palm Beach 2 km,” but points you in the same direction you came from. Ignore the sign and turn right (east). You will pass a brook with a small bridge, and after 6 km you will be at the coast, at a small parking area next to a couple of taverns. Leave your bike in front of whichever tavern you like best so that the tavern owner can keep an eye on it - needless to say, you’ll promise him that you will eat there after your swim - and continue on foot (Palm Beach is only ten minutes away). The sight you will see is indeed beautiful: lots of palm trees growing alongside a river that divides the beach into two parts and flows into the sea. Yet the famous beach attracts too many visitors and campers, and especially in the high season it is extremely crowded and filthy. If you are looking for empty beaches with crystal-clear water, take the dirtroad (D3) that you’ll see about two or three hundred metres before the taverns. This goes east and takes you to the road (A3) that connects Kerames and the Aghia Irini beach in the south. 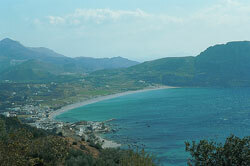 The beaches between Aghia Irini and Aghios Pavlos in the east are the best of Crete (see Route 13 and Road Book 5). If you get back to the route and follow the road (A3) north of the abandoned Kato Moni Preveli, it will take you to Assomatos. After the village the road continues through the impressive Kourtaliotiko gorge with the high steep walls. At the north end of the gorge there is an intersection. If you want to complete Route 12 and to get to Rethimno, continue straight (in the direction of Koxare). After a while, you will hit the main road (A2) that connects Aghia Galini with Rethimno, and from there it’s only a matter of fifteen to twenty minutes till you reach the town. If, however, you have no desire to go to Rethimno, turn right (east) and follow the road to the picturesque Frati. If you keep going east, the road (A3) will take you to Aghia Pelagia and then to Mixorrouma, and from here you can either continue eastward, following Route 13, or cross the main road and continue toward Karines in the north (from where you can follow Route 14). A third option, for those that have off-road bikes and enjoy beautiful scenery, is to follow the dirtroad (D2) that starts at the east exit of Frati and takes you to Mourne. You will pass through a wooded area with plenty of chapels and places suitable for camping, then get to the village and continue on the asphalt-paved road that leads to Spili. Here you have again two options: continuing south towards Aghia Galini (see Route 13), or taking the dirtroad (D3) northeast of Spili in order to get to Patsos and take Route 14.